VOA Special English - EDUCATION REPORT - Foreign Student Series: College, University or Institute? EDUCATION REPORT - Foreign Student Series: College, University or Institute? Americans use the term "college students" to mean students either in colleges or universities. Not only that, Americans almost never say "going off to university" or "when I was in university." That sounds British. Instead, they say "going off to college" and "when I was in college." College, university: what's the difference? We answer that this week in part three of our Foreign Student Series on American higher education. Colleges and universities have many things in common. Both offer undergraduate degrees in the arts and sciences, for example. And both can help prepare young people to earn a living. But many colleges do not offer graduate studies. Another difference is that universities are generally bigger. They offer more programs and do more research. 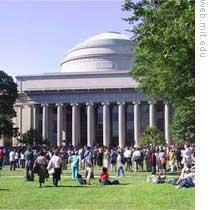 Another place of higher education, especially in technical areas, is an institute, like the Massachusetts Institute of Technology. Yet even an institute of technology can offer a wide choice of programs and activities. M.I.T. says that seventy-five percent of freshmen come there with a strong interest and involvement in the arts. Modern universities developed from those of Europe in the Middle Ages. The word "university" came from the Latin universitas, describing a group of people organized for a common purpose. "College" came from collegium, a Latin word with a similar meaning. In England, colleges were formed to provide students with places to live. Usually each group was studying the same thing. So college came to mean an area of study. The first American universities divided their studies into a number of areas and called each one a college. This is still true. A college can also be a part of a university. For example, Harvard College is the undergraduate part of Harvard University. Programs in higher learning can also be called schools, like a school of engineering or a medical school within a college or university. You know, learning all these terms is an education in itself. And that's the VOA Special English Education Report, written by Nancy Steinbach. Our reports are at www.unsv.com. We invite your questions for our Foreign Student Series. We cannot offer any personal advice or assistance. But we might be able to answer a general question during our series. Be sure to tell us your name and where you are. Write to special@voanews.com. I'm Steve Ember. I finaly konw the differences between college and university. that's right , but i knows it on my university 2006 .
university is generally bigger than college. There are many similar or same about the difference and common of universities and colleges in china and America. University is an eare for study and research,but college is an eare only for study not providing graduate study. In many times , the mean of university and college in some countries is very different . College and University is different in our country. in many times,it's just the same meanings! a little difference and a little similarity. A college can also be a part of a university.